The AJA ATC ORION 8 HV Series Sputtering System has eight 2" magnetron sputtering sources and tuning chimneys designed to optimize deposition uniformity. The deposition uniformity is within ±5% over a four inch sample. It is equipped with two 750W DC power supplies. The following metals are typically available: Aluminum, Titanium, Copper, Gold, NiCr, Chromium, and Nickel. 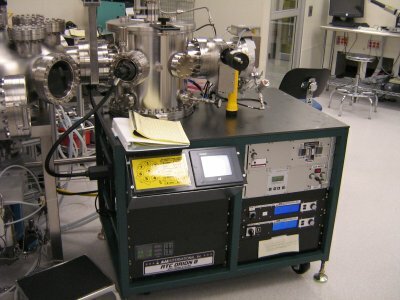 This system is currently attached to the Cluster Tool, which allows the user access to metal sputtering, dielectric sputtering and e-beam evaporation without breaking vacuum. The cluster tool is equipped with a loadlock system, which reduces system contamination and provides a cleaner film deposition.